October 16, 2010 — Gulfstream Aerospace Corp. recently rolled out the 300th Gulfstream G550 aircraft at its manufacturing facility in Savannah. The large-cabin, ultra-long-range business jet received its certificate of airworthiness from the Federal Aviation Administration (FAA), thereby completing its initial phase of manufacturing. From mid-October until late February, the aircraft will be painted in Savannah and outfitted at Gulfstream’s Brunswick, Ga., facility in preparation for its scheduled delivery to an undisclosed international customer in February. The G550 along with its sister, the G500, were officially introduced Sept, 9, 2002, at the National Business Aviation Association (NBAA) convention in Orlando, Florida. 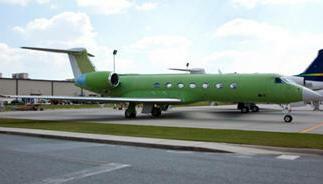 The first G550 was delivered on Sept. 17, 2003. Later that year, the G550 development team was honored for its technological breakthrough with the National Aeronautic Association’s Robert J. Collier Trophy, the most prestigious aviation award in the United States. Powered by enhanced Rolls-Royce BR710 turbofan engines, the G550 has a range of 6,750 nm (12,501 km) at Mach 0.80 and a high-speed cruise capability of Mach 0.87. With its long legs, the G550 easily links Washington, D.C., with Dubai, London with Singapore and Tokyo with Paris. The G550 fleet recently surpassed 404,000 flight hours. The G550 has a 12-month dispatch reliability rate of 99.89 percent. In addition, it has compiled 50 city-speed records, including one this year. On Feb. 17, a G550 reached a top speed of 532.19 mph in a flight from London to Tokyo. The G550 is equipped with the Gulfstream PlaneView cockpit, the most advanced flight deck in business aviation. The cabin aboard the aircraft combines productivity with exceptional comfort. It features up to four distinct living areas, three temperature zones and a choice of 12 floor plan configurations with seating for up to 18 passengers.